Transgender visibility in television: are we making progress? In January 2016, a study estimated that there are 650,000 transgender people living within the UK. A Williams Institute report from 2011 found that approximately 700,000 North Americans are transgender; it did not consider how many people might be yet to come out. Despite these significant numbers, transgender characters are rarely seen on terrestrial television, and when they are, they are often poorly represented. The 2012 GLAAD report stated that if a show was ‘progressive’ enough to have transgender characters, 21% of them would be villains. Of the most recognisable transgender characters within TV and film, there are still more cisgender people than transgender people playing trans roles. These include Rebecca Romijn as Alexis Meade in Ugly Betty, Jeffrey Tambor as Maura Pfefferman in Transparent and Dot Jones as Shannon Beiste in Glee. This needs to change. These roles require integrity and emotion for story lines that deal with some of the issues that real transgender people face, and with audiences pushing for equality, it would be favourable to have someone who is transgender play these crucial roles. By casting trans actors, it may help to stop the reinforcement of negative stereotypes that perpetuate. Shows that feature well developed, well written and well represented characters are usually those not made for terrestrial television, with Netflix Original shows playing a large part in increasing transgender representation. Representations on cable and subscription service TV tend to be more progressive that their terrestrial counterparts. As a result, the shows that I’m focussing on are Orange Is the New Black (OITNB) and Sense8, both of which are Netflix Originals, Orphan Black, which is a show developed for BBC America airing in the UK on BBC Three and – from its fourth season – streaming on Netflix in the UK and, finally, Glee which aired on Fox. Who doesn’t like being able to relate to our on-screen heroes? The type of shows that are more likely to feature transgender characters are ones that already have, or are anticipating, a large following of fans from the LGBTQ+ community. Shows that feature other characters who identify as something other than cisgender or straight, are shows that will arguably have more people watching them who also identify somewhere on the LGBTQ+ spectrum. Who doesn’t like being able to relate to our on-screen heroes? Laverne Cox is arguably the most successful transgender person within contemporary television. She has been featured on the front page of Time magazine, was nominated for a Critics’ Choice Award for best supporting actress, was the first transgender person nominated for an Emmy Award. Her popularity is largely due to her performance on the hugely successful show Orange Is the New Black. Cox plays one of the leading characters, Sophia Burset, who is an inmate at Litchfield Penitentiary. About her character, Cox said, “Sophia has some beautiful and rich storylines in the show I have never seen a trans woman of color get to play on television”. A large part of OITNB’s audience are from the LGBTQ+ community. This is, for the most part, due to the queer characters and relationships featured on the show. Due to this demographic, one perspective is that the audience will be more accepting and rejoice at the inclusion of a trans actor and trans character. OITNB is an example of a show that explores some of the issues raised specifically by intersectional feminists, including gender, race, poverty and sexual orientation. This may be because audiences for the show are either themselves from a diverse or underprivileged background like many of the characters, or at least express support for these people and push for equality. American professor and civil rights advocate Kimberlé Crenshaw coined the term intersectionality in 1989 to put a name to a movement that understood that different women face different sorts of oppressions and to varying degrees, with a particular emphasis on black women. This type of feminism tends to focus on the struggles of women of colour, trans women’s rights and women from a lower income background – all issues raised by OITNB. OITNB features Laverne Cox’s character prior to transitioning during scenes showing Sophia’s backstory. The character was played by Cox’s twin brother, after casting directors found it hard to find the right actor. 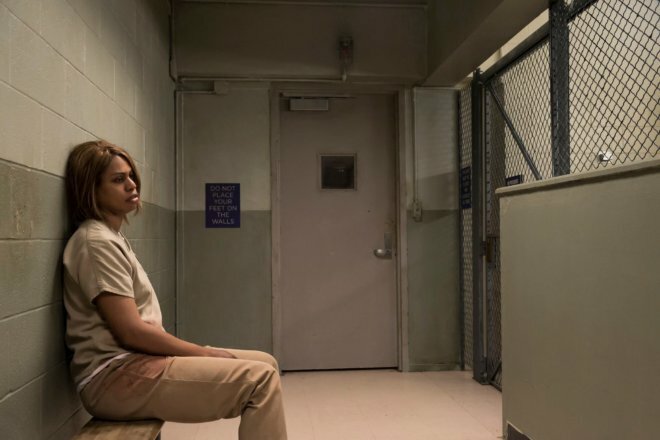 While the show highlights the discrimination Sophia faces – at one point prison guards withhold her hormone treatment – it doesn’t necessarily correlate with the real struggles and danger that transgender people face within the prison system. With a high number of trans women being placed in men’s prisons, this systematic injustice has caused many individuals to be harmed or killed in different countries around the world. Moreover, for those transgender people within the UK without a Gender Recognition Certificate, a document which takes time, money and hassle to obtain, they are at risk of not being placed within a prison of their assigned gender, placing them in severe danger. Sense8 is a Netflix Original sci-fi series, whose leading trans female character, Nomi, is played by the transgender actor Jamie Clayton. It is worth noting that the series was created by the Wachowskis: two trans sisters who, arguably, have more insight into how to accurately represent trans characters and fight stereotypes. Although the show itself doesn’t deal with Nomi transitioning, it still breaks boundaries when it comes to the representation of trans characters, not least because she is played by a trans actor. The show is another example where a LGBTQ+ audience was already expected, not only due to her character being queer, but because the show also features another gay character, who is struggling with his sexuality and coming out. Sense8 and OITNB are leading the way for shows to be inclusive in casting trans actors. It is also a huge step towards transgender equality to see a trans person playing a trans role. Jamie Clayton recently aired her frustration in a series of tweets regarding the casting of cisgender actors for transgender characters. If trans people are objecting to the casting of cisgender people in trans roles, they are the people we should be listening to. A scene in the first episode of Sense8 helps shine some light on the issues trans women face by being excluded by other women. During a scene where Nomi and her girlfriend Amanita are attending a Pride celebration, Amanita is told by her friend that Nomi is “just another colonising male trying to take up any space left to women”. It is important for television to show characters like this, to help people understand and recognise the inequality and transphobia that exists in the queer and feminist communities. Sense8 does well to show this behaviour and condemn it. Orphan Black has a recognisably large LGBTQ+ following that the writers and producers make an effort to acknowledge. The show follows a woman who finds out that she is a clone and learns about her ‘sisters’ and where they come from. The show introduced a trans male clone in season two, played, as all the clone characters are, by Tatiana Maslany. This character, Tony, only appeared in one episode, but was well received by viewers, and was a role that Tatiana Maslany enjoyed playing. Although the role of a trans man was played by a cisgender woman, it is important to note that this was due to him being a clone, and that the show seemingly did not exploit the fact that he was trans to gain views or media coverage. During the episode he is featured in, Felix, a gay man played by Jordan Gavaris, and sister to one of the clones, Sarah Manning, who also happens to be bisexual, noticeably corrects one of the other characters who misgenders him seemingly accidentally. Situations surrounding use of the wrong pronoun are common for trans people to face, and although misgendering isn’t always intentional, it is still something that should be addressed more often in television to show the consequences and effects that it can have on trans people. The actor Tatiana Maslany also plays a lesbian character on the show; Cosima Niehaus. This inclusion of yet another LGBTQ+ character supports the shows well rounded representation of LGBTQ+ people; as Cosima explicitly states, her sexuality isn’t the most interesting thing about her. The creators and cast of the show have expressed their ongoing support for the LGBTQ+ community many times and have made an impact on ‘normalising’ the representation of these characters. When Tony finds out he is a clone, for example, he is less disturbed and shocked than the other characters. He explains that this is because he dealt with his identity a long time ago. I believe that Orphan Black has developed queer characters not to try and make a political statement, but simply because queer people exist and need to be recognised and represented. The creator’s choice to not have a show centred around straight, cisgender people succeeds in reflecting the world we live in. It is impossible to talk about shows that represent LGBTQ+ characters and storylines without mentioning Glee, which aired on Fox from 2009 to 2015. Glee acquired a large LGBTQ+ fan base and influence and over the course of the show’s six seasons many of the storylines were based around characters’ sexuality and gender. The show arguably has the most LGBTQ+ storylines and characters of any other TV show in history. Glee’s writers have stated that its queer characters will be the show’s legacy. The show even featured a choir of 200 transgender people in an episode entitled ‘Transition’. This episode also marks the return of the shows two recurring transgender characters. Out of all of the shows I have look at that have a LGBTQ+ following, Glee seems to have the largest and most diverse fan base. Glee is progressive and has taken a huge step forward in the fight for more diversity on screen, with specific inclusion of trans characters. It should not be forgotten, however, that the trans characters are played by cisgender people, so even though Glee is possibly the most progressive show on terrestrial television, there is still room for progress. It is also important to note that Glee was broadcast on terrestrial television, as opposed to the other shows I have mentioned which were broadcast via Netflix or cable. This is a groundbreaking move towards diversity of representation as terrestrial television reaches a larger audience from different backgrounds and of different age groups. There is an undeniable amount of work that needs to be done to tackle transphobia around the world. Television seems to be a good place to work on this, by offering a platform for positive representation of trans characters and, even more importantly, trans actors. When looking at the shows that develop trans characters and hire trans actors, it is somewhat clear that for the most part, shows that already have a LGBTQ+ audience, or at least other LGBTQ+ characters, will be more likely to show these characters living their day-to-day lives, without their gender being the focus of the character’s storyline. It is perhaps worth noting that this representation should not stop at these already diverse and inclusive shows; there needs to be a stronger push on mainstream television alongside the examples that I have discussed. These shows reach an audience who perhaps have less knowledge and experience with seeing LGBTQ+ characters, but are an audience that still need to be introduced to positive representations of trans characters. The representation of trans people dealing with some of the same sorts of issues that everybody faces is important in helping people see these characters and actors as equal, even if there are still improvements to be made. Without their gender being the focus of the character, it allows for more authentic characters with interesting character development that the audience can connect to and empathise with. 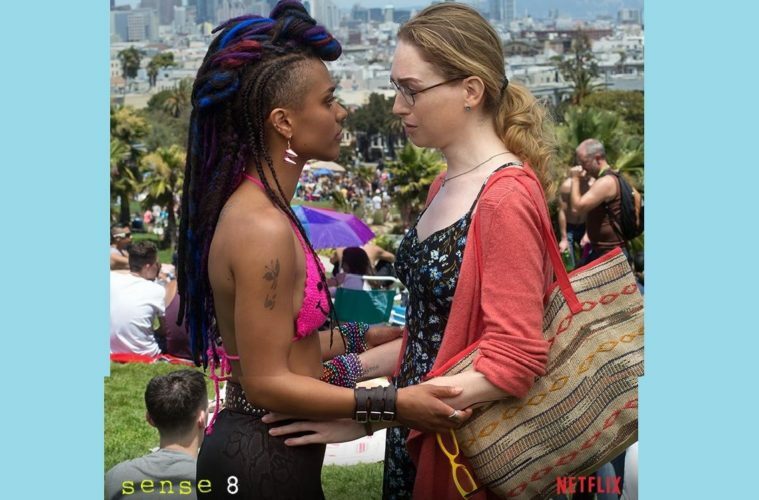 The feature image is a photo of actors Freema Agyeman and Jamie Clayton in their roles of Nomi and Amanita in Sense8. A young black woman in a bikini top with an elaborate mix of buzzcut and dreadlocks in black, blue, purple and red faces a young white woman with spectacles, blonde hair in a ponytail, a flowery dress and cardigan. The two women look lovingly at one another. This photograph was found on the Sense8 Facebook page and is used here under fair dealing. The second image is a photo of Laverne Cox in her role as Sophia in Orange is the New Black. An unhappy looking young black woman with long straight brown hair and a beige prison uniform sits on a bench in an empty cell leaning against the wall. This photograph was found on the Orange is the New Black Facebook page and is used here under fair dealing. 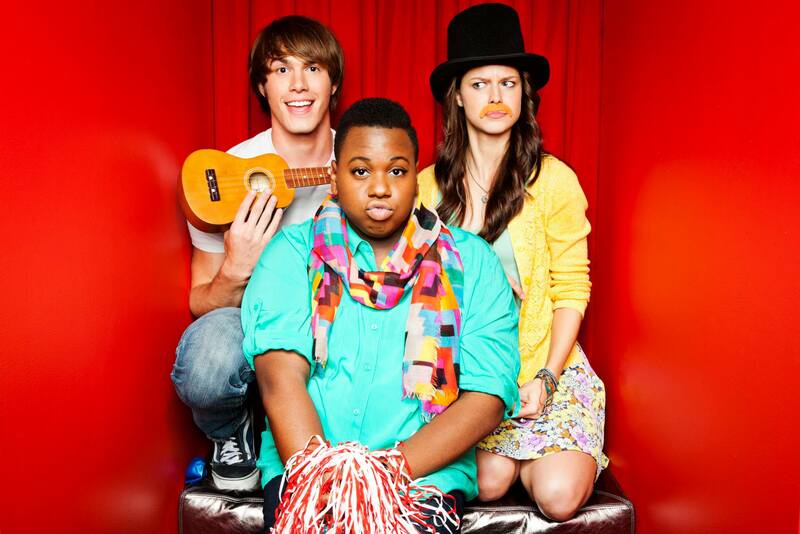 The third image is a photograph of Alex Newell as Wade/ Unique, Blake Jenner as Ryder,and Melissa Benoist as Marley in Glee. A young black man with short black hair, a surprised expression and a colourful geometric scarf, holds a pom-pom while behind him sits a young white smiling man with short brown hair and a ukelele and a young white puzzled woman with long brown hair, a ginger moustache and a top hat. This photograph was found on the Glee Facebook page and is used here under fair dealing.